BlueStacks, the company behind a series of apps allowing consumers to run Android apps on a variety of platforms, is about to stake a claim to the apparently lucrative microconsole gaming market, rivaling products such as the Kickstarter phenomenon that is the OUYA gaming console. Having seen just how quickly BlueStacks Android App Player has become a household name thanks to its ability to facilitate the running of Android titles on OS X, Windows and others, it was perhaps only a matter of time before the company looked to expand, and having seen how much hype the OUYA has generated in its short, crowd-funded life, has come up with an alternative device in the form of the GamePop. Having amassed significant funding from venture capitalists ranging from Qualcomm Ventures to Intel Capital, BlueStacks looks in very good shape, and since the GamePop will operate a subscription service costing around $7 per month, the company is already touting it as the Netflix of the gaming world. 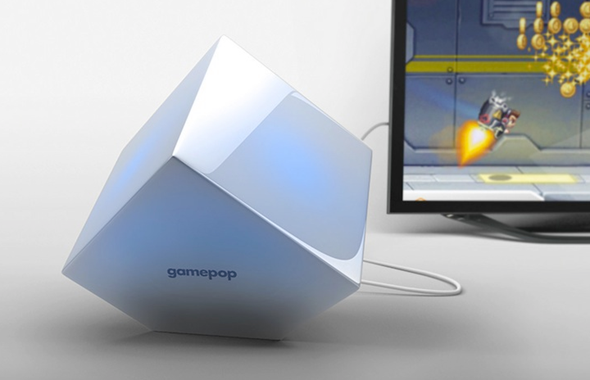 The GamePop will arrive as a small, cube-shaped box, and will ship with one control pad. Those pre-ordering the console this month will see their initial subscription cover the cost of the console itself, which is not only a pretty sweet deal, but also throws down the gauntlet to OUYA, which at $99, suddenly doesn’t seem as cheap as it did. For some sort of analogy, think of the OUYA as a Blu-Ray player; once you’ve paid to own it, you will then have to shell out for Blu-Ray movies. Once you have parted with that initial lump sum, you will still have to pay for your Android games to run on it. GamePop plays much more like Netflix, and since many consumers seem quite taken with the growing number of streaming / subscription services, I would tout GamePop’s chances of battling the OUYA juggernaut as strong indeed. It’s worth noting that the subscription is annual, and when the numbers are crunched, the total fee is $83.88 per year. Also, once the pre-order phase has run its course this month, GamePop will cost around the same as the OUYA, and although BlueStacks’ Marketing lead John Gargiulo says the final price hasn’t been decided, it’s unlikely to eclipse that of its main rival. Still, the only upfront cost for forward-thinking GamePop owners to bear is the $9.95 shipping fee, and with a deluge of game developers already on board including Halfbrick (Jetpack Joyride, Fruit Ninja), BlueStacks looks to have all the necessary forces in place to launch a credible microconsole dogfight. Developers will benefit from the fact that BlueStacks will demand absolutely no commission on in-app purchases on GamePop, while half of the subscription fees will also be shared back with developers.